The team at Lean on Life recently sent us an interesting article on Sugar Substitutes. Lean on Life is a team of committed health, nutrition and fitness experts with a website that combines the skill set of several doctors, nutritionists, fitness trainers, health coaches, chefs and passionate foodies. They aim help you look and feel your best by sharing invaluable health, fitness and weight loss secrets all in one place! Trying to avoid sugar? There are a host of other options – both natural sweeteners and artificial sweeteners – each with its vocal proponents and detractors. We’ve rounded up a top ten list to help you thresh out which sugar substitutes are safe for your health, and which ones may have health effects that are questionable. Aspartame has been used as an artificial sweetener for around 30 years, and the medical community is still split between those who think it’s safe for health and those who find it potentially dangerous. It is the primary artificial sweetener in diet sodas and found in Equal brand sweetener. Amidst wide-scale scientific controversy, conspiracy theories and financial conflicts of interest, aspartame has emerged from the health wars as one of the most vigorously tested food additive to date, deemed safe for health by over one hundred different regulatory agencies from around the world. However, studies continue to find negative side effects from this artificial sweetener found in so many commercial drinks and products; it’s wise to monitor your intake of aspartame and be sure you aren’t overdoing this non-nutritive sweetener. Sucralose is derived from sugar, but contains no calories and is 600 times sweeter, so you can use significantly less of it. Many people think that it is a natural sweetener, as it is originally derived from sugar. But turning sugar into sucralose requires replacing part of the sugar molecule with chlorine. This renders it lower in calories, but also creates a structure reminiscent of numerous pesticides. Sucralose is the artificial sweetener found in Splenda, and there is less evidence against it than other sweeteners. But it is too new to know potential long-term health effects. One of the earliest artificial sweeteners, saccharin was deemed unsafe for many years, and carried a health warning label that it caused cancer in lab animals. Now, however, after further testing, the label has been removed: human bodies did not demonstrate the same health effects seen in lab rats. Saccharin is frequently known for the metallic after-taste it leaves. 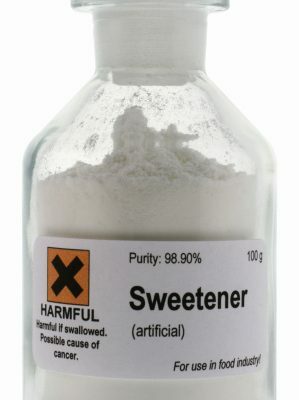 If the taste doesn’t bother you,nor the thought of tumorous lab mice, current studies render this artificial sweetener to be safe for human consumption. Stevia is a calorie-free natural sweetener that comes from a plant in the Chysanthemum family. Some find it to have a bad aftertaste in food, but for many, it is the sweetener they’ve been waiting for. Common Stevia usage in Japan dates back over 30 years, lending credence to its safety for health. It’s also been used as a natural sweetener in its native South America for centuries, in various forms. Because of its naturally concentrated sweetness, only the smallest proportion is needed to replace sugar in recipes. It may require some experimenting with different forms (liquid or powder) and brands to find one whose taste suits you, but the general consensus is that this natural sweetener is safe for your health. Many people mistakenly think that honey is better for you than sugar; but when it comes to calories, they are actually pretty equal. However, honey is sweeter, so you don’t have to use as much. It’s also less processed compared to sugar, whose high processing needs carry environmental concerns and strip away any natural nutritional content that it originally contained. Some people prefer local raw honey for its trace nutrients and potential anti-viral, anti-bacterial, anti-fungal and wound healing health benefits. When using this natural sweetener as a sugar substitute in baking, keep in mind that it’s important to use less and to reduce other liquids. Like honey, molasses is a natural sweetener that works well as a baking and cooking substitute, but requires tinkering with the recipe since it has a different sweetness and consistency. It can contain many minerals; a rule of thumb is the darker the molasses, the better for health and the more nutrient dense it is—but it will also have a stronger “molasses” flavor to it. It contains more calories than sugar, but because it’s sweeter it can be used in smaller quantities. Date paste is easy to make at home (soak dates and then throw them into a blender), or can be purchases pre-prepared at many stores. The result is a vaguely caramel-flavored sweetener, exchangeable for agave, honey, or other liquids. Closer to its original, raw form, date paste is a natural sweetener that retains its fiber and nutritional content, making it a health ful alternative to refined sugar. Date sugar, which is dehydrated and ground dates, can be substituted for both brown and white sugar. It is less sweet than sugar, but healthier overall, and carries none of the potential side effects of the artificial sweeteners. A relatively new artificial sweetener, Neotame is thousands of times sweeter than table sugar. It’s manufactured by the same company as aspartame, and isn’t available direct to consumers yet. But it’s already being used as an additive in some foods, and no labelling is required. Critics of Neotame claim that it is actually more toxic than aspartame, and that the studies have been flawed. Given its relationship to aspartame and the controversy already brewing, it’s another artificial sweetener who’s health effects are still questionable and should be avoided thus far. If you know where it’s hiding that is. This no-calorie, no-aftertaste artificial sweetener seems like an ideal solution, but it needs to undergo more testing. It’s currently approved by the FDA for general purposes; however, some experts worry that it may be a potential carcinogen, and all seem to agree that it’s best to stick to small doses. Since it’s so new to the market, it’s wise to be wary until more health research is undergone and side effects are studied more thoroughly. Agave liquid and powder are the latest sweetener crazes, trying to jump on the natural sweetener bandwagon along with Stevia. However, agave syrup and other derived sweeteners are often highly refined and processed products, and their production is unregulated. While some variants are organic, most are made from the root of the plant instead of the traditional stem, and are heavily processed. Due to the lack of consistency in production, and without a clear label deeming the product raw, organic and sourced from the stem, there is no guarantee that agave has any more health benefits than other sweeteners. Visit Lean on Life to learn more about improving your life today!